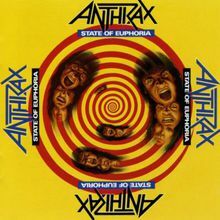 By far and away the best Anthrax album....lots of heart, honest, abstract, lyrically twisted on target...'Now its Dark' is a klassick. There version of 'Antisocial' destroys all others.... This album could make for a decent personal soundtrack for The Comedian. And 'Finale' is one of the best outro songs ever..."I drank 3 six packs, just so I could look at your face,,,,finale....See ya. Over, Finished, Done, Gone, Out!! Now Im free!